Hello, from our church welcoming committee! 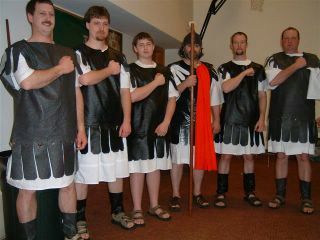 Actually, these are Roman Guards from the Passion Play presented this past March 25-27 by the Grace Brethren Church of Martinsburg, Pennsylvania (Jim Laird, pastor). Please pray for a GO-Team from the Martinsburg, Pennsylvania, Grace Brethren Church that is leaving for Prague, Czech Republic today, Saturday, July 16. The team will be working with George and Cindy Swain and will focus on contact-making and relational evangelism through teaching English. Sorry, Terry, but since I know how much you like to get comments I just had to put it in.